It was thought that the British airship died following the loss of the R101 and dismantling of the R100. Various plans were offered to revive the airship, however it was not until almost exactly 50 years later did a new breed of British airship take to the skies. had been part of the Shell Gas Transportation project, involving the design of a revolutionary new large non rigid airship. The airship was to be a giant gas transporter. This project did not get further than the design stage. However Roger realised that there was a role for the Airship, which could not be supplied by aeroplane nor helicopter in aviation today. Initially the AD500 which was to be come the prototype for a successful series of Skyship 500's took shape on the drawing board back in 1976. 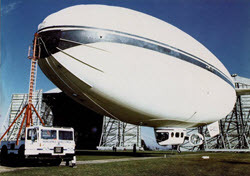 Airship Developments, the company formed for the venture, later Airship Industries, went on to create a very successful fleet of multi-role airships. 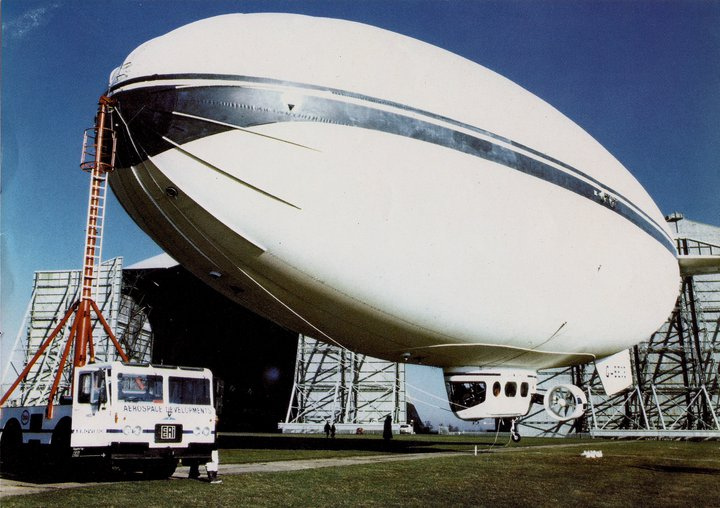 The AD 500 was seen as a modest sized airship of only 182,000cft. From the outset of the project, the designers were to incorporate the most modern materials wherever possible where technology could offer. One of the main and most important features of the new ship was the propulsion system. The designers carried an idea which had been utilised in the earliest days of the airship programme, the use of vectored thrust engines. The propellors were in fact ducted fans, tilted in order to drive the airship upwards or downwards; a principle very similar to the Harrier Jump Jet V/STOL applies to maximum advantage. The propulsion ducts allowed the units to swivel through 200 degrees rotation allowing full maneuverability of the ship. Unlike previous airship designs, by putting the fans in to "cowels" this gives the advantage of low propellor noise and improved safety to passengers boarding the ship. The influence of Roger Monks maritime background would be seen in the design of the large gondola. This was constructed of kevlar, making it a giant reinforced plastic shell, being not only sturdy but also offering design flexibility, ease of manufacture and also very low maintenance. The gondola itself is suspended from the top of the envelope by a fail safe system of 14 kevlar suspension cables and a sheer collar for horizontal restraint. The load of the gondola is spread along four arched parabolic load curtains bonded to the top of the envelope. The layout of the gondola is for maximum comfort with the skyship 500 able to carry 9 passengers and 3 crew. The large windows could be opened and offered spectacular views for those who enjoyed the flights. The nose of the gondola offered a spectacular view for the pilots who could see almost 180 degrees unimpeded disability by the large windscreen. Even though the ship has 2 seats in the cockpit, the Skyship was developed for one pilot operation. The control is offered by twin control yokes which operate all of the control surfaces, as there are no rudder pedals as in conventional aircraft. The engines are operated by single lever control mounted on a central control console. By March 1978 all the major components had been assembled in the No1. hanger at Cardington, a fitting place for the rebirth of the airship as it was the same hanger which had assembled the R100 some 50 years earlier. The construction of the ship did not go without it's problems and the initial launch of the ship had to be set back. A buyer had also been found for the new product and so it was important that the new airship prove it's viability. 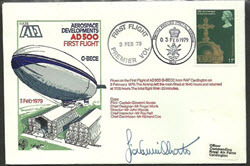 The prototype, the AD500 was first flown on 3rd February 1979. Using vectored thrust and ducted engines, this enhanced the ships maneuverability, and hence did away with the need for a large and expensive ground handling crew. The prototype was short lived as disaster struck the AD500 on 8th March 1979, when moored out at Cardington a storm blew up and the crew were unable to take the ship in to the shed. It was agreed that the emergency rip cord be used to deflate the ship before it would be totally destroyed. All was not lost, having proved itself a success, orders for the ship soon came in and the first of the new Skyship 500�s were produced. In the years 1980-1990 6 500 series ships were built. The ships were used worldwide not only for advertising but for security and passenger skycruises over the major cities. In 1983 the first ever charter of an Airship was arranged and the sponsor of the ship was Fuji. The ship was delivered in March 1984 and in July of that year, the company made it's first outright sale of a ship to Japan Airship Services, a division of Japan AirLines. Later another sale was made to JAS, the Korean Government and one to Tokyo Metropolitan Police for internal security. Later on in 1984 Los Angles Olympics was a true showcase for the ship, being involved in the opening ceremony. The Fuji chartered ship had the words Welcome emblazoned on it's side. Later on in that year the use of the same ship, GBIHN was shown to full effect in the hit James Bond film A View to a Kill. By mid 1988 there were 5 skyship 500's in operation throughout the world. In the latter part of the 1980's the Airship Industries Skyships and Skycruise programme had been immensely popular. Not just showing that airships were flying billboards, but for a schedules passenger flight programme over the major cities of the world. The 1987 Skycruise programme was offering a schedule of 700 flights in a season (from March to October) and the popularity was so high for the seats on the airships, that they all flights were sold out within 72 hours. 500-01 G-BECE Cardington February 1979 Mast-head / nose cone failed on mast in high winds March 1979. Deflated. Not rebuilt. Gondola and engines are at the South Yorkshire Aircraft Museum "viewable but stored outside pending restoration"
500-03 G-SKSA Weeksville (USA) April 1983 Assembled in Canada. Sent to UK for conversion to HL 1988. 500-04 (HL) G-SKSC Paris March 1984 Assembled in Canada. Damaged by elevator hinge failure in cruise, 17th May 1985, USA. Rebuilt with new envelope. Transferred to UK 1987 for conversion to HL. 500-05 JA - 1003 Tokyo May 1984 Assembled in Japan. Lost in training accident March 1988. 500-06 G-SKSH Touring USA August 1985 Assembled in USA. Converted to HL in June 1990. Crashed in Argentina 22nd November 1996. The Skyship 500 model was see as the proving model in the Airship Industries fleet and was immensely popular. Multiple times per season, the advertising livery could be changed with Airship Industries offering monthly advertising contracts on the side of the ships. 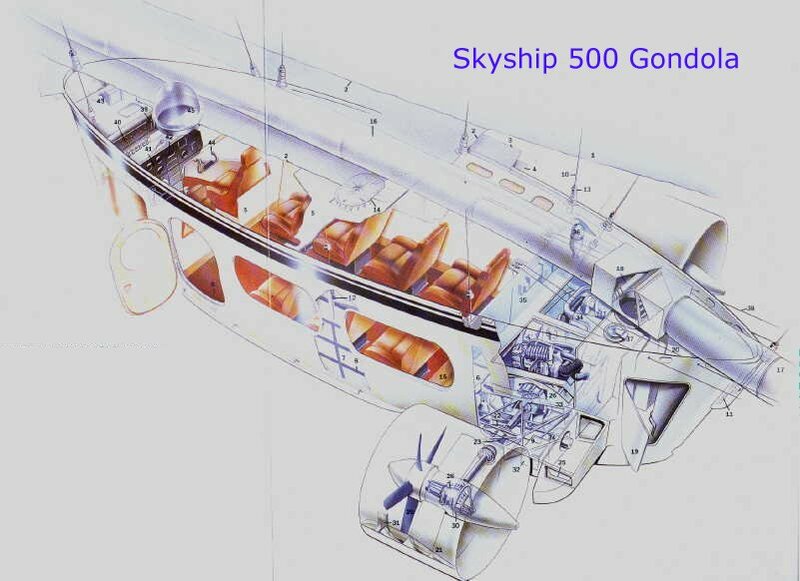 The Skyship range was enhanced with the addition of the 500 - HL (heavy lift) series whereby a skyship 500 gondola was attached to a larger Skyship 600 envelope. This had the added advantage of offering up o 30% more lift for the airship with no additional weight costs.